Episode 2 of Season 5 sets up many future plots, but no one storyline dominates it. Cersei is assuming her role as “king.” Myrcella Baratheon may be in danger from Prince Oberyn’s vengeful family. 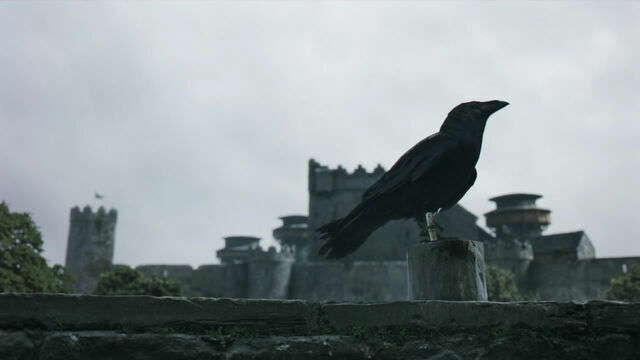 Arya arrives at the House of White and Black in Braavos. Like this season’s first episode, this episode focuses on the difficulties in ruling and the problems in administering justice. While Stannis administers justice too harshly, Daenerys doesn’t have a full command of it yet. It is hard to balance the need to punish fiercely enough to create respect (and fear of the law) with the need for mercy. It is also hard to balance justice against the political dimension. Does Daenerys make the wrong decision? Arya arrives in Braavos and the ship’s captain ferries her out to the island where the House of Black and White is located. A shrouded man answers the door. Although Arya shows him the iron coin, he sends her away. Still, she waits on the island, hoping the man will change his mind. After what appears to be several days pass, she finally gives up and returns to the city. Later on, in the city, the man who answered the door at the House of Black and White rescues Arya from some thugs. Together they return to the island, and he welcomes Arya into the House of Black and White. It turns out that the man is Jaqen H’gar. After he changes his face to the Jaqen face, he explains to Arya that he has no identity anymore – a state that Arya also must embrace. Before Cersei (Lena Headey) lies the red-viper statue with Myrcella’s necklace dangling from its fangs. (c) HBO. Despite Oberyn Martell’s promise that they do not hurt little girls in Dorne, Cersei’s daughter Myrcella may be in danger. Cersei receives a red-viper statue with Myrcella’s lion pendant hanging from its mouth. In response, Jaime decides to go to Dorne to find Myrcella. The one-handed knight, however, cannot rescue his daughter single-handedly. Jaime goes to Bronn at Stokeworth castle. Bronn is strolling on the beach with his betrothed, Lollys Stokeworth. Bronn seems to be genuinely enjoying her company. When Lollys complains about her mean sister — and mentions they will never live in the castle — Bronn notes that her mean sister may get what is coming to her. Jaime makes Bronn an offer you would think he couldn’t refuse. Help me in Dorne, Jaime urges, and I will give you a much better girl and a much better castle. Later, Cersei inspects another decapitated dwarf’s head. Her efforts to capture Tyrion have not let up. Cersei gives Qyburn the dwarf’s head for his work. Later still, at a small council meeting, Cersei appoints “Tommen’s” council, which she stacks with sycophants. Cersei states she will function in the role of the Hand until Tommen comes of age. Despite the loud protests of Pycelle, Cersei names Qyburn the Master of Whispers due to his loyalty. Cersei also appoints Mace Tyrell — the son whom Olenna Tyrell describes as a fool — as Master of Ships and Master of Coin. Kevan and Cersei argue. It is clear this is a puppet council: Tommen is not even there as an observer. When Cersei refuses to explain Jaime’s “sensitive diplomatic mission” to Kevan (Master of War) since it is “not his concern,” Kevan quits the post and states he will be at Casterly Rock. Pod and Brienne eat in a tavern when Pod spots Sansa with Littlefinger. (c) HBO. While eating in a tavern, Pod and Brienne spot Sansa and Petyr Baelish surrounded by knights. Brienne kneels before Sansa, recounts her vow to Catelyn, and offers to protect Sansa. Littlefinger impeaches Brienne’s ability to protect anyone, and Sansa rejects Brienne’s services, noting she saw the lady warrior kneeling before Joffrey at his wedding. Just then, Brienne realizes that she is in danger from Littlefinger. Petyr Baelish would not want Brienne carrying tales that he knows Sansa’s whereabouts (let alone has her), so he tries to stop Brienne from leaving. An altercation in the woods follows and Brienne takes down several knights. Sadly, it becomes even clearer that poor lovable Pod has no combat or horsemanship skills. Is Myrcella in Danger in Dorne? Ellaria Sand (Indira Varma) is no shrinking violet. Here she confronts Prince Doran’s guard. (c) HBO. From a high balcony, a bereaved Ellaria Sand glowers at Myrcella, a living symbol of the house who slayed her lover. Ellaria is furious. She demands an audience with Prince Doran and she urges him to avenge his brother’s death. Ellaria tries to push Doran into war. The Sand Snakes are with her, Ellaria threatens. Then it becomes clear what Ellaria really wants. She is not really there for war. She is softening Doran up so that he agrees to her real wish. She wants Doran to give her Myrcella (to kill). Ellaria wants to send Myrcella to Cersei one finger at a time. Prince Doran reminds Ellaria that they do not mutilate little girls for vengeance in Dorne. Another Bad Decision in Meereen? Daario Naharis and Grey Worm go looking for the Sons of the Harpy assassin. In a house in a quiet alley, they find a man they assume is the assassin hiding behind a wall. Later when Daenerys discusses what to do with the assassin with her council, Barristan Selmy urges a fair trial. The others implore Daenerys to order the assassin’s execution. Later, when the rest of Daenerys’ councilors leave, Selmy tells Daenerys that people did not lie about her father, his madness, and his atrocities. Selmy warns her not to stamp out dissent the way her father did. The mad king gave his enemies the justice he thought they deserved and each time it made him feel powerful. Daenerys heeds Selmy’s counsel and states the assassin will have a fair trial. But, perhaps this is not the right decision. In short, the slaves refuse to allow Daenerys to be intimidated by the Sons of the Harpy since they fear being returned to chains. They also don’t understand the process of the law Daenerys has in mind. Without remorse Daenerys publicly executes her loyal servant, the former Meereenese slave. Daenerys is resolutely unmoved by his pleas for forgiveness and the crowds’ please for mercy. Daario wields the executioner’s blade. As her former servant’s head hits the ground, the crowd of former slaves — who called her Mhyssa only a few moments before — turn on her hissing. One of these former slaves throws a stone at the nobility and a riot nearly ensues. Later that night, Daenerys stands on her balcony, miserable. And, Drogon returns to her. Did he come to comfort his mistress? Daenerys is tentative, unsure how he will react to her. But she just manages to touch his nose before he takes flight again. We only see Tyrion and Varys briefly. They travel by covered wagon or caravan to Volantis (where they will find the road to Meereen). Tyrion confesses that he didn’t leave with Shae when she urged him to because he liked the power of being Hand. Tyrion is also restless, tired of being in the caravan, and wants to go for a walk. Sam and Gilly bicker as Shireen teaches Gilly to read. It turns out that Gilly had two sisters who had the greyscale. Gilly then tells Shireen the unfortunate story of how their greyscale transformed them and how Craster dragged them out into the woods (presumably to their death). Meanwhile, Stannis tempts Jon with legitimacy and Winterfell. Stannis would make him Jon Stark and lord of Winterfell if Jon swears fealty to Stannis. Although this is more than everything Jon has ever wanted, Jon will likely refuse because he has sworn an oath to the Night’s Watch. Later on, the Night’s Watch vote on their new commander, and Sam puts Jon forward. Even though Alliser Thorne raises the specter of doubt about Jon’s closeness with the Wildlings, the vote is tied between Jon and Alliser. Maester Aemon breaks it by voting for Jon. I’m very interested in your thoughts about Daenerys’ actions. Was Daenerys wrong to execute her servant (the former slave)? Her most loyal subjects wanted her to release him and probably do not understand the justice system she has in mind. Does a fair trial mean anything to a people who have never experienced that style of justice? Is it hypocritical that the former slave didn’t get a fair trial? After all, she is condemning her servant for depriving the alleged assassin of a fair trial. Is Daenerys a lousy ruler, or is she simply getting her sea legs? I think Daenarys’ mistake was that she didn’t explain her actions. The Meereenese are used to masters making unilateral decisions without their input, and if she wants to keep their trust, she has to explain more of why he deserve to die, painting the picture of how the law works so the crowd understands. By the short speech and sentence she kind of brought the response on herself because she was acting just like the masters. I’m so glad you put in the section here about Brienne and Littlefinger. Things happened so fast my husband and I were both left saying “Why would she do that?! ?” Now it makes sense. Thanks! And I think Ellaria Sand is like, my new favorite character after Arya. I can’t wait to see what she does next! The execution scenes in episode 1 and 9 of season 1 are mirror images. Ned kills the man even though he doesn’t want to because that is the law and he does the execution himself. Joffrey has Ned killed because he like killing people. I don’t see the lack of trial as an issue because the man confessed. But she didn’t need to make an immediate decision either. The Danny execution is set up as a Joffrey execution for Ned reasons. The point is that it is a no win situation for Danny, if she lets the slave live she looks weak and if she kills him she undermines her popularity. The point is that Danny really needs Tyrion who is traveling towards her in the box. The box is also a mirror of two previous journeys, the one taken by Tyrion on the boat and the one the wizard who castrated Varys took to meet his (unspecified) fate in Kings Landing. The point is that Danny really needs Tyrion. However the comparison with Cersei is also important, Danny is at least trying, Cersei is oblivious to the fact that governing is hard. So she makes the lord of a landlocked kingdom master of ships and master of coin to buy him off. Loyalty is more important to her than ability and she says so. Dany is very young of course (book Dany is even younger if the old brainbox is functioning correctly). I suppose she could have given the former slave something like prison with hard labour. She does need a wise counsellor – since she sent Jorah away she only has Barristan really; Daario is more “muscle” than wise counsellor I feel. Looking back I made loads of mistakes when I was 14 and I wasn’t ruling a city, albeit show Dany may be a little older, 16 to 18 or so. Of course we don’t know what function Tyrion will play in Dany’s entourage (from publicity stills they do meet at least on the show this season). Phillip may well be right and Tyrion will be able to give Dany sound advice if she will listen to him. Connie’s point is salient too – but would the recently released slaves be sophisticated to understand Dany’s reasoning if she did give them the whys and wherefores? I don’t want to be a cad and give spoilers – suffice to say that show Ellaria is turning out to be a somewhat different creature to book Ellaria this season, but I think it could work. Indira Varma has the acting chops to pull it off. I don’t think spoilers need to be much of a worry this season. D&D have a lot of material to get through even if the series is extended to eight seasons and there would be no trouble at all extending it to nine. The whole of the final season has to be the final showdown between the red god of fire and the god of ice. So that leaves a heck of a lot to get done in season six regardless of whether this is a seven or nine season epic. I think we are going to see a lot of funerals this season. The only characters that are absolutely essential are Tyrion and Danny. Hi Jamie, Great recap as always. Cersei’s machinations with the Small Council and in being Regent to the young King are ( to me) so very reminiscent of what Elizabeth Woodville attempted or what her intentions may have been upon the death of Edward IV. Elizabeth Woodville didn’t achieve this particular feat , as we all know, but I saw an interesting historical echo of it here in the episode. I’m so thrilled with Season 5! Meereen is a culture with no notion of democracy. In fact only the Free Folk seem to have any values akin to democracy out of the whole Martinverse. I felt the crowd’s hissing was not earnt. I think a crowd used to being slaves would have gasped and been shocked and frightened by the beheading of one of their own by their messiah queen. Defiance was an emotion harshly repressed in their recent history. There is a saying that freedom can be defined as a change of masters, meaning the master changes from an external party to the person being his own master. This is a difficult concept for people used to having masters outside of themselves. Dany is their new master now, whether she likes it or not. It takes a long time for people to change this way of seeing the world. I also think it would have had more impact on Dany herself if she suddenly saw the crowd viewing her as a frightening master, but I guess that’s not going to be part of the unfolding plot of a city out of control.